I’m not shy about reposting really great and amazing recipes. This recipe is really nice , impressive and Fun!! Make them ahead of time and keep in refrigerator, slice and bake when your guests arrive. Enjoy again and again ! Puff Pastry Sheet-Frozen is just as good when your in a pinch try Trader Joe’s or Waitrose brands. Blitz all with a pinch of sea salt in cuisinart or blender. Buy and number of delicious brands in the refrigerated section of your grocers. Lay out chilled tart pastry, round or square. smooth out pesto on top of pastry covering entire surface. sprinkle with sundried pesto and goat cheese pieces . 20-25 minutes keep an eye on it ,your oven may be hotter than mine. 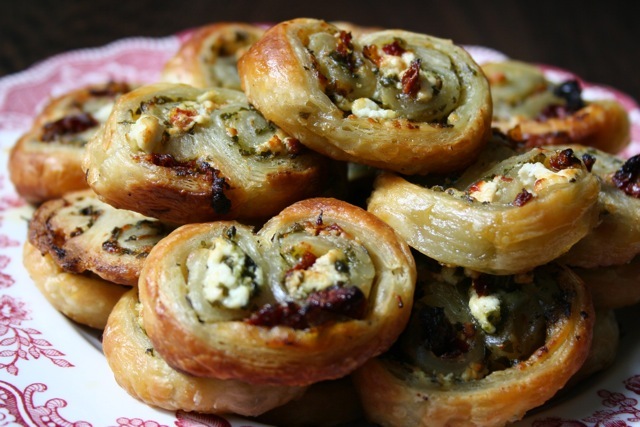 This entry was posted on Thursday, December 19th, 2013 at 10:53 pm	and tagged with appetizer, easy pin wheels, flaky pinwheels, Hor'derves and posted in Category. You can follow any responses to this entry through the RSS 2.0 feed.